JavaServer Pages Standard Tag Library (JSTL) is a custom tags collection that executes common functionalities in web applications, including iteration and selection, data formatting, XML manipulation and database access. JSTL allows JSP developers to focus on development specific necessities, instead of reinventing the wheel. What is Expression Language (EL)? Expression Language makes easier the access to implicit objects, such as request / response servlet, scope variables and stored objects on JSP scope (page, request, session and application). EL reduces drastically the need of using JSP expressions and scriptlets, increasing web applications maintainability and extensibility. 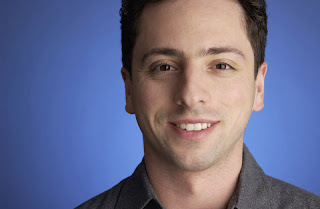 Sergey was born in Moscow, Russia, to a Jewish family, the son of a mathematician and economist. In 1979, when Sergey was six, his family emigrated to the United States. Brin attended grade school at Paint Branch Montessori School in Adelphi, Maryland, but he received further education at home; his father Michael Brin, a professor in the department of mathematics at the University of Maryland, nurtured his interest in mathematics and his family helped him retain his Russian language skills. In September 1990, after having attended Eleanor Roosevelt High School, Sergey enrolled in the University of Maryland, College Park to study Computer Science and Mathematics, where he received his Bachelors of Science in May 1993 with high honors. After graduating from Maryland, Sergey received a graduate fellowship from the National Science Foundation, which allowed him to study for his masters degree in Computer Science at Stanford University. Sergey received his masters degree in August 1995 ahead of schedule in the process of his Ph.D. studies. Although he is still enrolled in the Stanford doctoral program, Sergey has suspended his Ph.D. studies indefinitely while he is working at Google. Sergey also received an honorary MBA from the Instituto de Empresa. Jeffrey P. Bezos was born in Albuquerque, New Mexico. His mother's ancestors were early settlers in Texas, and over the generations had acquired a 25,000 acre ranch at Cotulla. Jeffrey's maternal grandfather was a regional director of the Atomic Energy Commission in Albuquerque. He retired early to the ranch, where Jeffrey spent most summers of his youth, working with his grandfather at the enormously varied tasks essential to the operation. At an early age, he displayed a striking mechanical aptitude. Even as a toddler, he asserted himself by dismantling his crib with a screwdriver. Jeffrey was born when his mother was still in her teens, and her marriage to his father lasted little more than a year. She remarried when Jeffrey was four. Jeffrey's stepfather, Mike Bezos, was born in Cuba; he escaped to the United States alone at age 15, and worked his way through the University of Albuquerque. When he married Jeffrey's mother, the family moved to Houston, and Mike Bezos became an engineer for Exxon. Jeffrey showed intense and varied scientific interests at an early age. He rigged an electric alarm to keep his younger siblings out of his room and converted his parents' garage into a laboratory for his science projects. The family moved to Miami, Florida, where Jeffrey attended high school. In high school, Jeffrey fell in love with computers and was valedictorian of his class. He entered Princeton University planning to study physics, but soon returned to his love of computers, and graduated with a degree in computer science and electrical engineering. After graduation, Jeff Bezos found employment on Wall Street, where computer science was increasingly in demand to study market trends. His went to work at Fitel, a start-up company that was building a network to conduct international trade. He stayed in the finance realm with Bankers Trust, rising to a Vice Presidency. At D. E. Shaw, a firm specializing in the application of computer science to the stock market, Bezos was hired as much for his overall talent as for any particular assignment. While working at Shaw, Jeff met his wife, Mackenzie, also a Princeton graduate. He rose quickly at Shaw, becoming a senior Vice President, and looked forward to a bright career in finance, when he made a discovery that changed his life, and the course of business history. The Internet was originally created by the Defense Department to keep its computer networks connected during an emergency, such as natural catastrophe or enemy attack. Over the years, it was adopted by government and academic researchers to exchange data and messages. In 1994, there was still no Internet commerce to speak of. One day that spring, Jeffrey Bezos observed that Internet usage was increasing by 2300 percent a year. He saw an opportunity for a new sphere of commerce, and immediately began considering the possibilities. In typically methodical fashion, Bezos reviewed the top 20 mail order businesses, and asked himself which could be conducted more efficiently over the Internet than by traditional means. Books were the commodity for which no comprehensive mail order catalogue existed, because any such catalogue would be too big to mail; perfect for the Internet, which could share a vast database with a virtually limitless number of people. He flew to Los Angeles the very next day to attend the American Booksellers' Convention and learn everything he could about the book business. He found that the major book wholesalers had already compiled electronic lists of their inventory. All that was needed was a single location on the Internet, where the book-buying public could search the available stock and place orders directly. Bezos's employers weren't prepared to proceed with such a venture, and Bezos knew the only way to seize the opportunity was to go into business for himself. It would mean sacrificing a secure position in New York, but he and his wife, Mackenzie, decided to make the leap. Jeff and Mackenize flew to Texas on Independence Day weekend and picked up a 1988 Chevy Blazer (a gift from Mike Bezos) to make the drive to Seattle, where they would have ready access to the book wholesaler Ingram, and to the pool of computer talent Jeff would need for his enterprise. Mackenzie drove while Jeff typed a business plan. The company would be called Amazon for the seemingly endless South American river with its numberless branches. They set up shop in a two-bedroom house, with extension cords running to the garage. Jeff set up three Sun microstations on tables he'd made out of doors from Home Depot for less than $60 each. When the test site was up and running, Jeff asked 300 friends and acquaintances to test it. The code worked seamlessly across different computer platforms. On July 16, 1995, Bezos opened his site to the world, and told his 300 beta testers to spread the word. In 30 days, with no press, Amazon had sold books in all 50 states and 45 foreign countries. By September, it had sales of $20,000 a week. Bezos and his team continued improving the site, introducing such unheard-of features as one-click shopping, customer reviews, and e-mail order verification. The business grew faster than Bezos or anyone else had ever imagined. When the company went public in 1997, skeptics wondered if an Internet-based start-up bookseller could maintain its position once traditional retail heavyweights like Barnes and Noble or Borders entered the Internet picture. Two years later, the market value of shares in Amazon qwas greater than that of its two biggest retail competitors combined, and Borders was striking a deal for Amazon to handle its Internet traffic. From the beginning, Bezos sought to increase market share as quickly as possible, at the expense of profits. When he disclosed his intention to go from being "Earth's biggest bookstore" to "Earth's biggest anything store," skeptics thought Amazon was growing too big too fast, but a few analysts called it "one of the smartest strategies in business history." Jeff had told his original investors there was a 70 percent chance they would lose their entire investment, but his parents signed on for $300,000, a substantial portion of their life savings. "We weren't betting on the Internet," his mother has said. "We were betting on Jeff." By the end of the decade, as six per cent owners of Amazon.com, they were billionaires. The stock has split three times, and to this day, about a third of the shares are held by members of the Bezos family. Through each round of expansion, Jeff Bezos continually emphasized the "Six Core Values: customer obsession, ownership, bias for action, frugality, high hiring bar and innovation." "Our vision," he said, "is the world's most customer-centric company. The place where people come to find and discover anything they might want to buy online." Amazon moved into music CDs, videos, toys, electronics and more. When the Internet's stock market bubble burst, Amazon re-structured, and while other dot.com start-ups evaporated, Amazon was posting profits. In October 2002, the firm added clothing sales to its line-up, through partnerships with hundreds of retailers, including The Gap, Nordstrom, and Land's End. Amazon shares its expertise in customer service and online order fulfillment with other vendors through co-branded sites, such as those with Borders and Toys 'R Us, and through its Amazon Services subsidiary. In September, 2003, Amazon announced the formation of A9, a new venture aimed at developing a commercial search engine that focuses on e-commerce web sites. At the same time, Amazon launched an online sporting goods store, offering 3,000 different brand names. Amazon.com ended 2002 with annual sales over $3.9 billion, a figure analysts expect to grow by roughly 17 percent in 2003. Today, Jeff Bezos and Mackenzie live north of Seattle and are increasingly concerned with philanthropic activities. "Giving away money takes as much attention as building a successful company," he has said. Lawrence J. Ellison was born in the Bronx, New York. At nine months, he contracted pneumonia, and his unmarried 19 year-old mother gave him to her great aunt and uncle to raise. Lawrence was raised in a two-bedroom apartment on the South Side of Chicago. Until he was twelve years old he did not know that he was adopted. His great uncle and adoptive father had lost his real estate business in the Great Depression and made a modest living as an auditor for the public housing authority. As a boy, Larry Ellison showed an independent, rebellious streak and often clashed with his adoptive father. He showed a strong aptitude for math and science, and was named science student of the year at the University of Illinois. During the final exams in his second year, Ellison's adoptive mother die, and he dropped out of school. He enrolled at the University of Chicago the following fall, but dropped out after the first semester. his father was now convinced he would never make anything of himself, but Ellison had learned the rudiments of computer programming in Chicago and took this skill with him to Berkeley, California, arriving with just enough money for fast food and a few tanks of gas. For the next eight years he bounced from job to job, working as a technician for Fireman's Fund, Wells Fargo bank and began working as a programmer with large databases at Ampex. At Ampex he built a large database for the CIA, code name: Oracle. In 1977, Ellison and his former supervisor from Ampex, Robert Miner, founded Software Development Labs. They supported themselves by consulting for an assortment of corporate clients, when Ellison read a paper called "A Relational Model of Data for Large Shared Data Banks" by E. F Codd, describing a concept Codd had developed at IBM. IBM had seen no commercial potential in the concept of a Structured Query Language (SQL), but Ellison and his partner did. They created a database program compatible with both mainframe and desktop computer systems, renamed their company Oracle, and found their first customers for the database program, Wright Patterson Air Force Base and the CIA. In 1980, Oracle had only eight employees, and revenues were less than $1 million, but the following year, IBM itself adopted Oracle's SQL for its mainframe systems and for the next seven years, Oracle's sales doubled every year. The million dollar company was becoming a billion dollar company. Oracle went public in 1986, raising $31.5 million with its initial public offering, but the firm's zealous young staff for the rapidly expanding firm habitually overstated revenues, and in 1990 the company posted its first losses. Oracle's market capitalization fell by 80 percent and the company appeared to be on the verge of bankruptcy. Ellison bit the bullet and replaced much of the original senior staff with more experienced managers. For the first time, he delegated the management side of the business to professionals, and channeled his own energies into product development. The newest version of the database program was a solid success and in only two years the company's stock had regained much of its previous value. Even as Oracle's fortunes rose again, Ellison suffered a series of personal mishaps. Long an enthusiast of many sports and outdoor activities, in rapid succession Ellison suffered serious injuries while body surfing and mountain biking. Ellison survived major surgery, and continued to race his 78-foot yacht and practice aerobatics in his private jet. Oracle's fortunes continued to rise throughout the 1990s. America's banks, airlines, automobile companies and retail giants all depend on Oracle's database programs. Oracle has benefited hugely from the growth of electronic commerce; its net profits increased by 76 percent in a single quarter of the year 2000. As the stocks of other high tech companies fluctuated wildly, Oracle held its value, and its largest shareholder, founder and CEO Larry Ellison, had come very close to a long-cherished goal, surpassing Microsoft's Bill Gates to become the richest man in the world. Michael Dell, born in February 1965, is the chairman of the Board of Directors and chief executive officer of Dell, the company he founded in 1984 with $1,000 and an unprecedented idea - to build relationships directly with customers. In 1992, Mr. Dell became the youngest CEO ever to earn a ranking on the Fortune 500. Mr. Dell is the author of Direct From Dell: Strategies That Revolutionized an Industry, his story of the rise of the company and the strategies he has refined that apply to all businesses. In 1998, Mr. Dell formed MSD Capital, and in 1999, he and his wife formed the Michael and Susan Dell Foundation, to manage the investments and philanthropic efforts, respectively, of the Dell family. Mr. Dell serves on the Foundation Board of the World Economic Forum, the executive committee of the International Business Council and is a member of the U.S. Business Council. Mr. Dell also serves on the U.S. President's Council of Advisors on Science and Technology and the governing board of the Indian School of Business in Hyderabad, India. 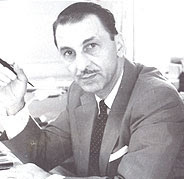 It is a measure of the man and the life he lived that long before his demise Jehangir Ratanji Dadabhoy Tata came to represent an exalted idea of Indianness: progressive, benevolent, ethical and compassionate. It did not really matter that the country itself failed this utopian test. JRD, as he was known to commoner and king, had by then transcended the frailties of his milieu. As an adolescent JRD loved France and flying more than anything else. By the time he stepped into the autumn of his existence he had devoted some 50 years to heading and defining a unique business conglomerate, and just as long to championing the interests of India and her myriad people. The evolution, from a thoughtful if self-indulgent young man to a pan-Indian icon revered even by those who knew little about business, contains the essence of the JRD story. Being one of the last of the great patriarchs of Indian industry contributed, no doubt, to the moulding of his legend, but to call JRD an industrialist is akin to saying Mahatma Gandhi was a freedom fighter. He considered his leadership of the Tata Group and his dedication to the cause of India as complementary, and he brought to the two undertakings a rare dignity and sense of purpose. It is said of JRD that he spoke French better than English and both better than any Indian language. That did not preclude him from forging a special bond with Indians of all ages and backgrounds. Kalpana Chawla, the Indian-born astronaut who perished in the Columbia space shuttle disaster, cited JRD and his pioneering airmail flights as her inspiration for taking up aeronautics. He touched the lives of countless others, rich and poor, manager and worker, as he became the embodiment of the principles and philosophy of the House of Tata. Nobody could have guessed this is how destiny would unfold when JRD was born, in Paris in 1904, to R. D. Tata, a business partner and relative of Jamsetji Tata, and his French wife Sooni. JRD, the second of four children, was educated in France, Japan and England before being drafted into the French army for a mandatory one-year period. JRD wanted to extend his stint in the forces (to avail of a chance to attend a renowned horse-riding school), but his father would have none of it. Leaving the French army saved JRD his life, because shortly thereafter the regiment he served in was wiped out while on an expedition in Morocco. JRD then set his mind on securing an engineering degree from Cambridge, but R. D. Tata summoned his son back to India (JRD would forever regret not being able to attend university). He soon found himself on the threshold of a business career in a country he was far from familiar with. This was a young man aware of his obligations to the family he belonged to. In a letter to his father on his 21st birthday in 1925, JRD wrote, "One more year has fallen on my shoulders. I have been looking back and also deep inside myself with the merciless eye of conscience, and have been trying to find out whether during this last year I have gained in experience or wisdom. I haven't found out much yet!" JRD entered the Tatas as an unpaid apprentice in December 1925. His mentor in business was John Peterson, a Scotsman who had joined the group after serving in the Indian Civil Service. At 22, soon after his father passed away, JRD was on the board of Tata Sons, the group's flagship company. In 1929, aged 25, he surrendered his French citizenship to embrace the country that would become the central motif of his life. The first of JRD's big adventures in business was born of his childhood fascination for flying. He had grown up in France watching the famous aviator Louis Bleriot's early flights, and had taken a joyride in an airplane as a 15-year-old. In 1929 JRD became one of the first Indians to be granted a commercial pilot's licence. A year later a proposal landed at the Tata headquarters to start an airmail service that would connect Bombay, Ahmedabad and Karachi. JRD needed no prompting, but it would take Peterson to convince Dorabji Tata, then chairman of the Tatas, to let the young ace have his way. In 1932 Tata Aviation Service, the forerunner to Tata Airlines and Air India, took to the skies. The first flight in the history of Indian aviation lifted off from Drigh Road in Karachi with JRD at the controls of a Puss Moth. JRD nourished and nurtured his airline baby through to 1953, when the government of Jawaharlal Nehru nationalised Air India. It was a decision JRD had fought against with all his heart. Nehru and JRD shared an unusual relationship. They had been friends for long and there was plenty of mutual respect, but they differed significantly on the economic policies India needed to follow. JRD was not a political animal and he never could come to terms with the nature of the socialistic beast then ruling the roost (he once joked, many years after Nehru's passing, that the Chinese steward the Taj Group of Hotels had brought in from abroad earned more money than him). JRD was an articulate and persistent votary of economic liberalisation long before it was finally implemented in India. The Air India saga certainly hurt JRD, but he wasn't the kind to bear a grudge. Nehru insisted that he continue to head the national carrier and that's what JRD did, right up to 1977, when another act of government forced him out. Indira Gandhi, when she came back to power, reinstated JRD to the chairmanship, but by then he no longer had the appetite for the responsibility. Air India was never just a job for JRD; it was a labour of love. Tata executives would always be complaining — in private, undoubtedly — that their chairman spent more time worrying about the airliner than he did running all of the Tata Group. JRD's ardour for and commitment to Air India was what made it, at least while he was at the helm, a world-class carrier. Wrote Anthony Simpson in his book Empires of the Sky: "The smooth working of Air India seemed almost opposite to the Indian tradition on the ground… [JRD] could effectively insulate Air India from the domestic obligation to make jobs and dispense favours." The qualities that JRD brought to the running of Air India were as much in evidence in his steering of the Tata Group. The 'permit raj' era created a difficult, if not hostile, environment for ethical entrepreneurship. The socialist dogma of the time insisted that capitalism was a creature that had to be rigidly controlled, to be tolerated but never trusted. JRD and the Tata Group were certainly stymied by the political tenets and orthodoxy of the period. When JRD was elevated to the top post in the Tata Group in 1938, taking over as chairman from Sir Nowroji Saklatvala, he was the youngest member of the Tata Sons board. Over the next 50-odd years of his stewardship the group expanded into chemicals, automobiles, tea and information technology. Breaking with the Indian business practice of having members of one's own family run different operations, JRD pushed to bring in professionals. He turned the Tata Group into a business federation where entrepreneurial talent and expertise were encouraged to flower. In later years this system began to fray at its edges. Detractors contend that it degenerated, as satraps and fiefdoms emerged to challenge the core structure of the Tatas. If it can be held against JRD that he failed to comprehend the dangers of handing away too much control in the operation of individual Tata companies, it must also be acknowledged that he took the lead in consolidating the group when matters came to a head. JRD was brave enough to run the gauntlet and he was man enough to face the fusillade that came in its wake. Conducting the affairs of a business empire as panoptic and complicated as that of the Tatas would by itself have been a prodigious task, but JRD had plenty more to offer. He played a critical role in increasing India's scientific, medical and artistic quotient. The Tata Institute of Fundamental Research, the Tata Memorial Hospital, the Tata Institute of Social Sciences, the National Institute of Advanced Sciences and the National Centre for the Performing Arts, each an exemplar of excellence in its field, were projects that would not have come to fruition without JRD's steadfast support. In India the term 'national interest' means all sorts of things to all kinds of people. To JRD it meant advancing the country's scientific and economic capacities. He had strong views on what would help India and what would hinder its gigantic struggle to eradicate poverty. Though he did his share of it, casual charity did not hold any charms for him. His inclination to put his own money where his beliefs were resulted in the setting up, in 1944, of the multipurpose JRD Tata Trust. A few years later he sold more of his shares and an apartment in Bombay to establish the JRD and Thelma Tata Trust, which works to improve the lot of India's disadvantaged women. A pet theme with JRD was India's "desperate race between population and production". Here, too, he disagreed with Nehru, who thought "population is our strength". JRD spent a considerable amount of time and resources in figuring out and propagating methods to control the country's population growth. To this end he helped start what eventually became the International Institute of Population Studies. In 1992 JRD received the United Nations Population Award, late recognition for a lifelong obsession. Despite his very public persona, JRD was a shy and reticent man. He never hankered after honours but was showered with them, to much bemusement on his part. On being told that the Indian government was thinking about giving him the Bharat Ratna, the country's highest civilian award, he is reported to have said: "Why me? I don't deserve it. The Bharat Ratna is usually given to people who are dead or it is given to politicians. I am not prepared to oblige the government on the former and I am not the latter." Self-effacing, modest, wistful and endearing are a few of the adjectives used to describe JRD. It wasn't all peaches and cream, though. JRD could not suffer fools and he was scathing when confronted with pomposity or pretension. There was always about him a dapper and cosmopolitan air, with a dry wit thrown in to lighten the load of legend. When a friend began a letter to JRD with the 'Dear Jay' salutation, he wrote back: "I have looked up the dictionary and find that a Jay is 'a noisy, chattering European bird of brilliant plumage' and, figuratively, 'an impertinent chatterer or simpleton'. For future reference, please note that my name is spelt 'Jeh', in abbreviation of 'Jehangir'. Any resemblance between me and the bird is purely coincidental." He and his wife, Thelma, whom he married after a Paris romance in 1930, did not have any children, but JRD always appeared most comfortable with kids. With adults, a more problematic lot, he displayed a generosity of spirit which held that, whether in business or in life, it was people who mattered. When JRD breathed his last, in a Geneva hospital on November 29, 1993, it could be truly said that an epoch had ended. A noble bit of India — and Indianness — was gone forever. Dhirubhai Ambani was the most enterprising Indian entrepreneur. His life journey is reminiscent of the rags to riches story. He is remembered as the one who rewrote Indian corporate history and built a truly global corporate group. Dhirubhai Ambani alias Dhirajlal Hirachand Ambani was born on December 28, 1932, at Chorwad, Gujarat, into a Modh family. His father was a school teacher. Dhirubhai Ambani started his entrepreneurial career by selling "bhajias" to pilgrims in Mount Girnar over the weekends. After doing his matriculation at the age of 16, Dhirubhai moved to Aden, Yemen. He worked there as a gas-station attendant, and as a clerk in an oil company. He returned to India in 1958 with Rs 50,000 and set up a textile trading company. Assisted by his two sons, Mukesh and Anil, Dhiru Bhai Ambani built India's largest private sector company, Reliance India Limited, from a scratch. Over time his business has diversified into a core specialisation in petrochemicals with additional interests in telecommunications, information technology, energy, power, retail, textiles, infrastructure services, capital markets, and logistics. Dhirubhai Ambani is credited with shaping India's equity culture, attracting millions of retail investors in a market till then dominated by financial institutions. Dhirubhai revolutionised capital markets. From nothing, he generated billions of rupees in wealth for those who put their trust in his companies. His efforts helped create an 'equity cult' in the Indian capital market. With innovative instruments like the convertible debenture, Reliance quickly became a favorite of the stock market in the 1980s. In 1992, Reliance became the first Indian company to raise money in global markets, its high credit-taking in international markets limited only by India's sovereign rating. Reliance also became the first Indian company to feature in Forbes 500 list. Dhirubhai Ambani was named the Indian Entrepreneur of the 20th Century by the Federation of Indian Chambers of Commerce and Industry (FICCI). A poll conducted by The Times of India in 2000 voted him "greatest creator of wealth in the century". 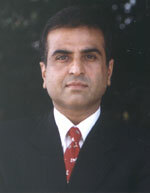 Dhirubhai Ambani died on July 6, 2002, at Mumbai. Among others, Wipro has recently won the prestigious 'Risk Management Award,' instituted by the Financial Times-The Banker magazine. What is that which makes this company so successful? 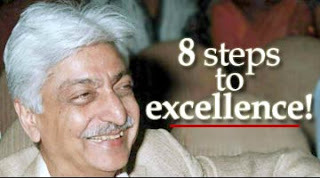 "An obsession for excellence," says Azim Premji, Chairman & Managing Director, Wipro Limited. Chairman and Managing Director of Wipro, Premji is credited with transforming Wipro, his family's vegetable oil business, into one of the world's foremost software company. Although one of the richest Indians, he flies economy class and is happiest when hiking, reading or discussing the foundation he has set up to promote primary education. These are changing times. Yet in the middle of all the changes there is one thing that constantly determines success. Some call it leadership. But to my mind, it is the single-minded pursuit of excellence. Excellence endures and sustains. It goes beyond motivation into the realms of inspiration. Excellence can be as strong a uniting force as solid vision. Excellence does not happen in a vacuum. It needs a collective obsession as I have experienced the benefits of excellence in my own life. Excellence is a great starting point for any new organisation but also an unending journey. What is excellence? It is about going a little beyond what we expect from ourselves. Part of the need for excellence is imposed on us externally by our customers. Our competition keeps us on our toes, especially when it is global in nature. But the other driver of excellence is internal. I have found that excellence is not so much a battle you fight with others, but a battle you fight with yourself, by constantly raising the bar and stretching yourself and your team. This is the best and the most satisfying and challenging part about excellence. How does one create excellence in an organisation? First, we create an obsession with excellence. We must dream of it not only because it delivers better results but because we truly believe in it and find it intrinsically satisfying to us. We must think of excellence not only with our mind but also with our heart and soul. Let us look outside, at the global standards of excellence in quality, cost and delivery and let us not rest till we surpass them. Second, we need to build a collective self-confidence. Organisations and people who pursue excellence are self-confident. This is because excellence requires tremendous faith in one's ability to do more and in a better way. Unless, we believe we can do better, we cannot. Third, we must understand the difference between perfection for its own sake and excellence. Time is of essence. Globalisation has made the customer only more impatient. This may seem like a paradox: should we aim for excellence or should we aim for speed? Excellence is about doing the best we can and speed lies in doing it quickly. These two concepts are not opposed to each other; in fact, speed and timeliness are important elements of quality and excellence. Fourth, we must realise that we cannot be the best in everything we do. We must define what we are or would like to be best at and what someone else can do better. Excellence is no longer about being the best in India. It is about being the best in the world. We have to define what our own core competencies are and what we can outsource to other leaders. Headaches shared are headaches divided. Fifth, we must create processes that enable excellence. Today, there are a number of global methods and processes available whether it is Six Sigma, CMM or ISO. Use them because they are based on distilled wisdom collected from the best companies in the world. Also, we must build a strong foundation of information technology, because in this complex, dynamic world, it is imperative that we use the most modern tools to keep processes updated. Sixth, we must create a culture of teaming. I have found that while great individuals are important, one cannot have pockets of excellence. Quality gives ample opportunities to build a culture of teaming. Cross-functional teams that are customer facing can cut through an amazing amount of bureaucracy, personal empire building and silos and deliver savings that one would not have imagined possible. The other advantage of building teams focussed on quality is that the teaming culture eventually spreads to the rest of the organisation and teaming becomes a way of life. Seventh, invest in excellence for the future. Future always seems to be at a distance. But it comes upon you so suddenly that it catches you by surprise, if not shock. What constitutes excellence in the future will be significantly different from what it is today. In these days of severe market pressures, there is big temptation to sacrifice the future to look good in the present. We must certainly trim our discretionary expenses, but we must ensure that our investments in strategic areas that lead to excellence in the future are protected. Finally, excellence requires humility. This is especially needed when we feel we have reached the peak of excellence and there is nothing further we can do. We need an open mind to look at things in a different way and allow new inputs to come in. Otherwise, there is a real danger of becoming complacent or even downright arrogant. I would like to end my talk with a story that illustrates this very well. A brilliant young professor went to meet a famous Zen master to have a discussion with him on Zen. He found himself in front of a modest house. He rang the doorbell and waited. A while later, he heard shuffling footsteps and the door was opened by the Zen master. He invited the professor to sit with him on the dining table. The professor was a little disappointed with the shabby appearance of the Zen master. He started quizzing him immediately on comparative philosophies and the Zen master gave some brief answers. When the professor began to debate with him on those answers, the Zen master stopped speaking and kept smiling at him. Finally, the professor got angry. He said, "I have come from a long distance just to understand the relevance of Zenism. But apparently you have nothing to say. I have not learnt anything from you at all." At this point, the Zen master asked the professor to have some tea. When the professor held the cup, the Zen master started pouring tea into it. After some time, the tea started spilling and the professor shouted, "Stop! The cup can contain no more." The Zen Master stopped and then, once again smiling, he said, "A mind, full of itself can receive nothing. How can I speak to you of Zenism until you empty your mind to learn." The professor understood and apologized to the Zen master. He parted from him, the Zen master -- a wiser man. The author is Chairman & Managing Director, Wipro Limited.